Start and end in Seattle! With the ski, snowboard & snow tour Methow Cross-Country Ski Tour, you have a 6 day tour package taking you through Seattle, USA and Mazama. 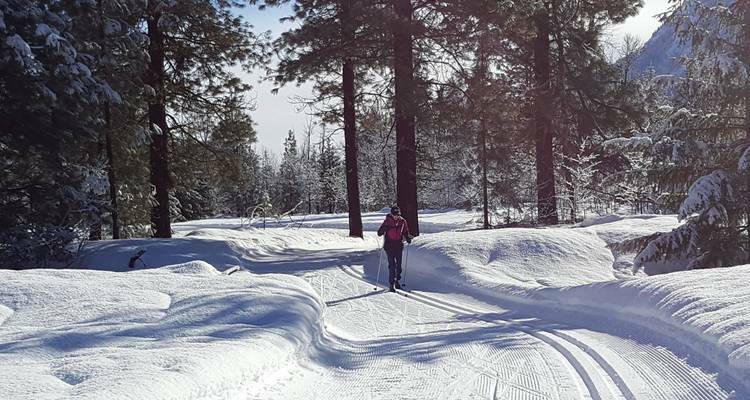 Methow Cross-Country Ski Tour is a small group tour that includes an expert guide, meals, transport and more. DAY 1 Meet in Seattle; we'll whisk you off to the Methow Valley for an afternoon ski lesson on the Wilson Loop. DAY 2 Try out the Mazama Trails today. Lessons for beginners and coaching for those who wish it included. DAY 3 Ski the River Run and Jack's Trail. This afternoon: ski more, or enjoy some downtime. DAY 4 Ski the Methow Community Trail to Brown's Farm. This afternoon, ski or get a massage at Sun Mountain's spa. DAY 5 Ski Thompson and Meadowlark trails today. Or maybe Sunnyside / Beaver Pond, Fox and Aqua. You choose. DAY 6 This morning, ski the Chickadee Trails. Head back to Seattle with us this afternoon. Start and end in Seattle. TourRadar only requires a deposit of $99 to confirm this Bicycle Adventures booking. The remaining balance is then payable 60 days prior to the departure date. For any tour departing before 23 June 2019 the full payment of $0 is necessary. No additional cancellation fees! You can cancel the tour up to 60 days prior to the departure date and you will not need to pay the full amount of $0 for Methow Cross-Country Ski Tour, but the deposit of $99 is non-refundable. If you cancel via TourRadar the standard cancellation policy applies. Some departure dates and prices may vary and Bicycle Adventures will contact you with any discrepancies before your booking is confirmed. TourRadar does not charge any additional cancellation fees. You can cancel the tour up to 60 days prior to the departure date. If you cancel your booking for Methow Cross-Country Ski Tour via TourRadar the standard cancellation policy applies. Oregon Crater Lake Hiking - NEW!